Cuba´s National Office of Statistics and Information (ONEI by its Spanish acronym) reported that by the end of May, 284,556 Americans visited Cuba, same amount than in all 12 months of 2016. The report adds that the last year marked the record of 284,937 people coming from USA to Cuba, for a 74 percent increase compared to 2015. The amount so far 2017 represents an increase of 145 percent compared to the same period last year, when 116,004 Americans traveled to the Caribbean island during that period. 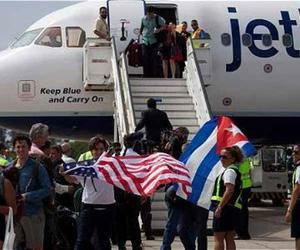 Statistics show that 166,455 Cubans living in America visited the archipelago until the end of May, for a 45 percent growth compared to the same stage of 2016, when 114,391 of them came. The opening last August of the regular flights of ten American airlines, and the growth of the arrivals of cruises facilitated that flow of travelers.